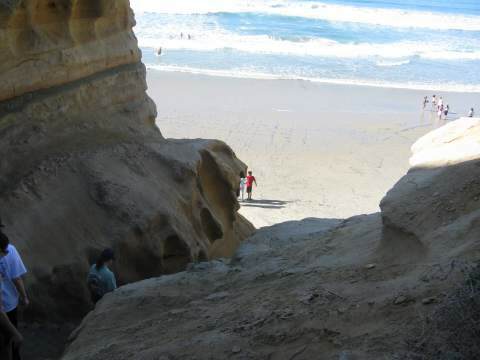 Hike the Scenic Trails in Torrey Pines State Reserve and see the Torrey Pines in La Jolla. 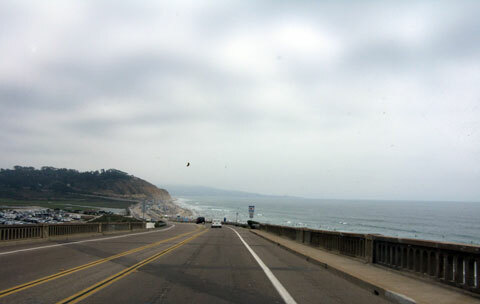 The Torrey Pines Reserve sits on the bluffs over Torrey Pines State Beach and Blacks Beach in San Diego, CA. 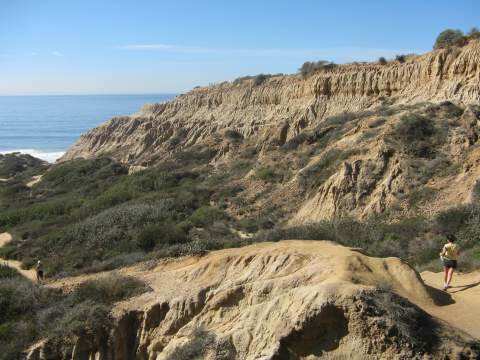 Torrey Pines State Park is one of the most popular and scenic sites in San Diego. Nestled on the bluff above the Pacific Ocean, it offers great hiking trails and stunning views. Our favorite hike at Torrey Pines State Reserve is to park at the bottom of the hill, walk up the road to get a nice workout (300 ft elevation gain), and hike the Beach Trail back. This can only be done at low tide. At high tide, there are many nice trails with view to hike. Operating Days and Hours: Open 365 day a year, from 8 AM to sunset (sunset may be 8 pm in summer and 5 pm in winter). You can hike or bicycle in the park as early as 7 AM. Services: Small visitor center. No picnicking allowed. High Tide Access: If you want to hike to the beach trail, ask a park ranger if the trail is open and if the tide will allow it. At high tide you may not have access to walk safely along the beach. Usually is good with tide 3 feet or lower, see the San Diego Tide Chart for the daily predicted tides for this year. Lifeguard: Lifeguards sporadically patrol the areas beneath the bluffs of Torrey Pines in La Jolla. Dogs: Dogs are prohibited at all times, even within a vehicle. Things NOT to do: No alcohol, no glass containers, no smoking, no littering, no disturbing noise, no beach fires, no dogs, no picnicking (except at the entrance near the parking lot), no overnight sleeping, camping or parking. Disability access: Limited disabled parking at upper parking lot on top of road. Most trails are steep and not wheelchair accessible. Disabled parking at lower lot on Torrey Pines Road, but road is steep. Hazards: Steep trails, unstable bluffs, rattlesnakes, and if you hike down to the beach beware that trails are sometimes eroded near the beach, but the beach hiking trail was great on my last trip in April 2010, with new steps and handrails. Once on the beach, stay back from cliffs as they can slide or large boulders can drop. Torrey Pines State Reserve is a wilderness area along the coast just north of La Jolla and south of Del Mar is San Diego, California. It is home to a rare pine tree - Pinus torreyana. Hikers can follow trails through wind-sculptured pines, and deep ravines overlooking the Pacific Ocean. A 1923 pueblo-style building is now the visitor center. The reserve is rich in native life and is popular with hikers and bicyclists. This is one of our favorite hiking trails in San Diego, with a 300 foot elevation gain as you hike up the road, and a variety of scenic loop dirt trails along the bluffs.